Pauline Hillaire (Scalla) a First Nation musician, storyteller and cultural historian, comes from a prominent Lummi family. Her father, Joe Hillaire, was recorded by Willard Rhodes in the 1950’s for the Smithsonian and Library of Congress collection of music of Puget Sound. Both of her parents taught her traditional songs and games in the Lummi Language and Chinook Jargon. She has taught traditional songs to children and members of the Lummi tribe and has traveled throughout the United States to share songs of Puget Sound. 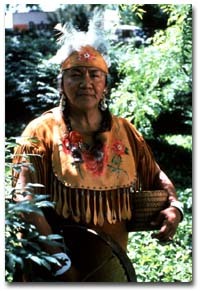 Pauline is well known as a prominent educator and taught classes in genealogy at the Northwest Indian College. She has worked on numerous educational grants, Title II education projects and symposiums on Native American music. She is a featured teacher/artist for programs at the Evergreen State College, Northwest Folklife, Seattle Public Schools, Shoreline School District, and other organizations. Pauline is an expert in native language, song, storytelling and dance traditions. As the head of the “Setting Sun Dance Group” she frequently gave performances at major venues through the Northwest.